The BBVA Open Talent competition has included in its ninth edition a special prize dedicated to the work of women in the financial technology space, a sector of innovation that has a markedly masculine character. 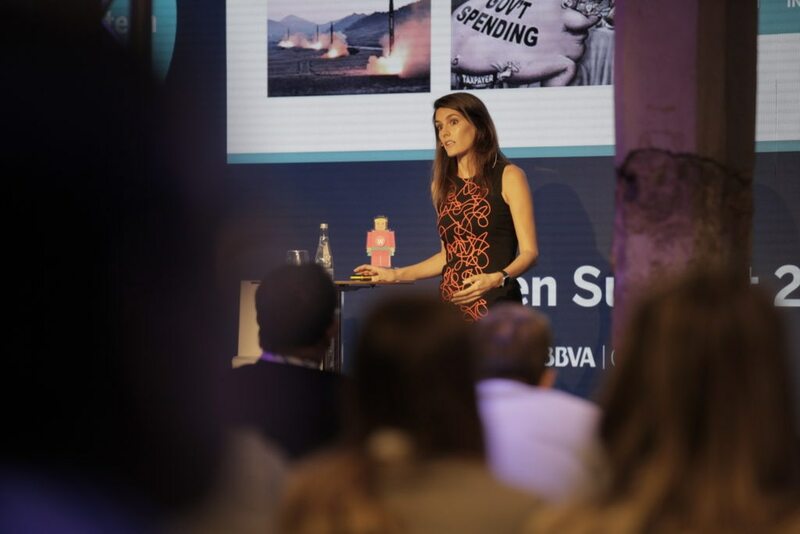 Madrid will host Wednesday the first BBVA Open Summit, an event that brings together startups, entrepreneurs and experts in innovation, all of them disposed to shake the financial services sector. Rebeca Minguela, founder of Clarity, has been named the first winner of the ‘Women in Fintech’ prize in the BBVA Open Talent 2017 competition, due to her “impressive career and her great contributions to the advancement of fintech,” said Paloma Tejada, head of Talent and Culture for the Customer Solutions division at BBVA, upon awarding the prize during the event BBVA Open Summit. “I’m truly grateful for this award because I believe that it is essential to shine the spotlight on women to inspire others,” said Rebeca Minguela, who also shared the award with all her team and especially her female employees, which make up about 40 percent of Clarity’s workforce. “We need more women in the tech and financial sector,” she added. Minguela is the founder and CEO of Clarity, a company that offers tools based on data science to optimize the social impact of companies, projects and NGOs, and which has been selected as one of the 10 finalists in the BBVA Open Talent Global Trends category. Rebeca Minguela during the awards ceremony at BBVA Open Summit. But, where are STEM women? “You can’t choose something if you are not aware that it exists.” With this simple and resounding phrase, Angela Paloma Martín, a political advisor and expert on women’s leadership and gender communication, referred to the lack of women in STEM (Science, Technology, Engineering, Mathematics) jobs during the presentation of the study Wanted: Female engineers, physicists and technologists. Why are not there more STEM women? With a long career behind her, this Spanish entrepreneur has triumphed in the United States, and the Davos Forum has included her in this year’s Young Global Leaders Class. Before founding Clarity, Minguela had started Blink Booking, the app for making last-minute reservations at leading European hotels (it was later acquired by Groupon). She also worked as a senior associate at Bain Capital Private Equity, a management consultant at the Boston Consulting Group and an engineer at the German Aerospace Agency, Siemens and IBM. “She’s an example and a model for all of us to follow,” said Paloma Tejada, during the Open Summit meeting in Madrid. The introduction of the ‘Women in Fintech’ prize was no accident. It is aimed at giving visibility to women that are working in fintech, a sector which is dominated by men, as shown by the data. According to Astbury Marsden Consulting, women occupy only 9% of the management positions in the 50 most relevant fintech companies in the United Kingdom. A similar situation exists in Spain, where only five of the 86 companies in the Spanish Association of Fintech and Insurtech companies were founded or co-founded by women. February 2015. Four people get together to have a few beers in Madrid, and they decide to set up Mujeres Tech. One month later, three women decide to create Girls in Tech in Granada while having breakfast together. Two independent organizations in pursuit of the same goal: to encourage the presence of women in the world of technology. Wanted: entrepreneurs, CEOs, mathematicians, scientists. The fintech world needs more female talent. This is the irrefutable conclusion of the many different studies on the subject. Experts say it isn’t simply a question of numbers. There are also much more profound factors that could benefit industries such as the fintech sector. Given their influence in the global economy, women can help develop specific products and solutions for needs that have not yet been identified, or sufficiently explored.